Our social media platforms are meant to provide an environment for cordial and harmonious discussions where your comments are not only welcome but encouraged. Comments must be pertinent, be related to the content of the topics already posted, and be respectful of other users. 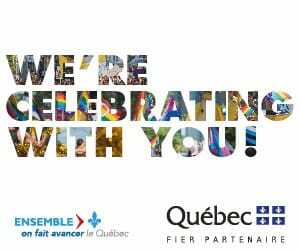 Please note that Pride Montréal is in no case responsible for the comments and opinions expressed by users. Messages expressing homophobic, biphobic, lesbophobic, transphobic, sexist, racist views expressed in an insulting, vulgar, gross, obscene, aggressive, disrespectful or discriminating manner. Personal or defamatory attacks or disrespect for others’ privacy. Abuse of sentences typed in all caps or the resending of mass postings (spam). Any advertising or promotional solicitation in any form that has not received prior authorization. The posting of personal information about oneself or another user. Comments inciting to racial, religious, ethnic, gender, orientation or other hatred. Any form of threat or inciting to physical or verbal violence. The unauthorized use of Pride Montréal/Canada Pride intellectual property. Any political message from an individual or an organisation aimed at promoting a defined agenda, to solicit support. We reserve the right to hide, delete or request the removal of any content deemed inappropriate or that ignores this netiquette, without notice. In case of significant or repeated abuse, we also reserve the possibility to ban a subscriber without appeal.